PH4480's any good? or JMMrace series? Jmm Race seem to be the top choice with the Pacies a real good second. Apparently they're a similar style to the JMM Race. The three most popular are JMM Race, JMM Scavenger and Pacemaker PH4480. JMM Race: 6-2-1 interference design, mandrel bent, long secondaries. Excellent Performance and Quality but you pay for it. JMM Scavenger: 6-2-1 interference design, press bent. Great performance and Quality. Pacemaker PH4480: 6-3-1 tuned length design, mandrel bent. Great performance and Great price. The AU series thermos mainly but the late E's as well have a problem with the brushes wearing out, and teh fan will at first only operate intermittantly, or not at all.. you can try blasting them with compresses air and degreaser, then drilling a small hole at the top of the engine case, and dropping some oil in there. If your thermo's are on the way out, or you dont have any yet. I, and all the other members with them(antony, eed-250, Fast futura, pauli, ect). Would recomend VOlVO thermo fans. These have almost 3 times the air flow rating (CFM) of the ford E and Au series thermo fans. and have a much higher quality motor. $80 for just the fan itself. $150 with a thermatically controlled ajustable davies craig switch, and relays. $200 installed, drive in drive out, inc setup of therm switch and fan. thats Much more reliable, better cooling, including the switch and a High Quality Recon fan, For less than teh price of just the ford Thermo setup. Pm me to organise transaction, or for more details. i miss you scotty, u goddamn goose! i know they're availible for the 5.0l v8's but can you get timing gears for the i6 instead of timing belts/chains? are they worth it, money, power increases? etc? You say that you can fit a AU XR8 snorkel to the EF/EF 6cyl falcon by using the method in the ford mods technical brief. I tend to disagree because I went out and sticky taped one so it would sit in the position it would screw down on. I then gently closed the bonnet slowly and to my suprise the rubber seal on top of the bonnet covers the top part of the mouth of the snorkel. Therefore rendering the snorkel useless with about the same airflow as the stock one. I then moved it up so it would fit on one original mounting point and shut the bonnet. The rubber seal just sits nicely behind the mouth but it isn't straight. I went back into ford and exchanged it for a EL GT snorkel which in my opinion is larger and better flowing plus it fits to the original screw points. So the moral of this story is if you are going to use an AU XR8 snorkel you need to mount it inline with the original screw holes and not back an inch or the rubber seal blokes the mouth, rendering it to be useless. Cheers Luke, have a nice day!!!!!!!!!! 14.77 @92.71mph July 06 14.52@95.68mph July 07 14.241 96.7 MPH in a shoebox/taxi au ford wagon! !Bwahahah still cant believe it!!! While this thread is a summation, i think that the apparent issues with the auxr8 snorkle being blocked by the rubber on ef/els should be addressed as a yay or nay. I've read alot about this and it seems about 50/50 (or maybe its just the same ppl writing the same thing in many threads). Or is the ELGT snorkle the way to go, and if so, is it worth the extra money??? 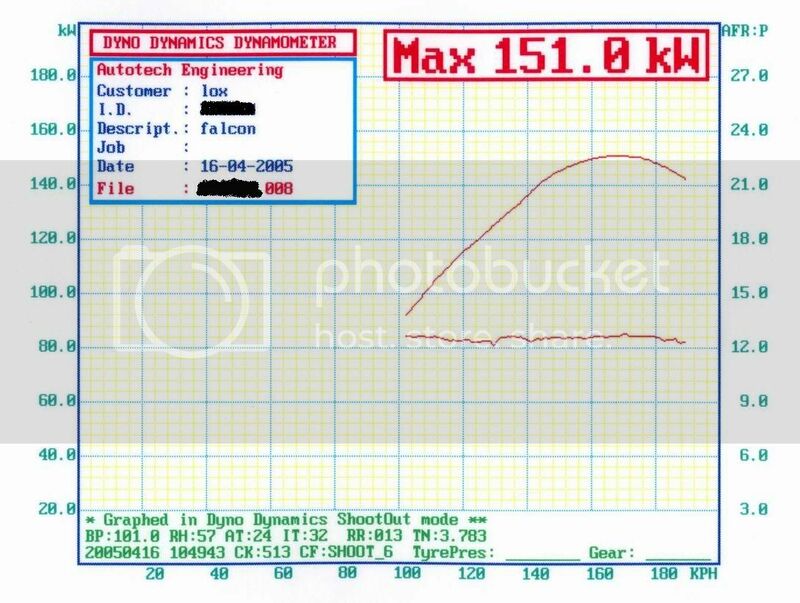 I have an old dyno chart for my EF Fairmont sedan daily driver. Listing the mods done and result gained the bottom line is airfuel ratio. The only mod at std was K&N air cleaner and airbox mod. At around the same time I did the 3" mandrel bent intake I fitted an XR6 fuel pressure regulator this is why the air/fuel ratio went way to rich as the computer had not fully adjusted and was running slightly richer. For those not having XR engines this mod was done because on an injector flow bench at the higher pressure(equivalant to std at full flow) the spray pattern was better then at the higher pressure the spray pattern was heaps better. OK for those who are unaware how the fuel pres reg works it holds pressure in the fuel rail and has a diaphram that is connected to manifold vacuum as vacuum is taken away it increases the fuel pressure the XR reg is the same pressure as the std one high pressure and 50 kpaor psi(I can't remember) higher at its high pressure. This regulator can be brought for around $100 new or used one should do. The difference when driven was the amount of low down grunt off the line as every time I gassed it off the lights it would turn the tyres and launch hard. Good value. Other mods not dynoed was the fitment of ss inductions intake *(an early version) now fitted with new style plastic one. PS must be due for another run soon as this is 2yrs old. [img][img]http://images5.theimagehosting.com/dyno.3.th.jpg[/img][/img]NOTE no extractors Cam or chip fitted. Yeah just go ask for a Redback 2.5", they aint very loud. I had to take the resonator out of mine to make it louder. Now I have to convince the wife its a good thing - you know better fuel economy etc. If I didn't go with an exhaust would some headers make some difference? I know it would be better combined with an exhaust but my exhaust is in really good nick and I really don't want to replace it... Because of the better flow from the engine would I have any problems with anything if everything else was still stock...... cheers! After purchasing my XG ute the other day ... all this information will definitely come in handy. hey i am new to this site, i have been sussing it out and was wondering what order i should go in for modifyin my 94ED fairmont?? Any order you like, but most recommend that you go for an exahust mod first.